Basic Bets. Whenever you hear a group of players cheering in the casino, you can almost bet they are standing around a hot craps table. Craps is the fastest-paced game in the casino. It´s also one of the most fun, but it can be intimidating to the new player. There are literally dozens of different bets you can make, and the language of the game may lead you to believe you´ve stepped into an alien world. But look around the table. See any rocket scientists? Okay, there may be one or two at the table, but most of the players are average men and women who have discovered just how easy Craps is.The Pass Line Let´s start with the game in its simplest form. The shooter gets the dice and places a wager – let´s say $10 – directly in front of him on the Pass Line. The Pass Line bet is the most common wager in Craps, and the one most players learn first. On the first roll of a game, called the Come Out Roll,the Pass Line bettor wins if the shooter tosses a seven or an eleven. These numbers are called “Naturals.” If the shooter throws a Craps number, the two, three, or twelve, the Pass Line bet is a loser. Any other number thrown becomes the “Point” and is marked with the “puck,” a large white “button” with the word “ON” facing up. Once the Point is marked up, the game continues until the shooter either repeats the point number or throws a seven. If he repeats the point, the Pass Line wager wins. If he “Sevens-Out” the Pass Line wager loses and another game begins. Pretty simple, right? Generally speaking, Free Odds bets can be made in multiples of your Pass Line bet, up to the maximum allowed Free Odds. Some casinos offer as much as 100 times Free Odds. Some casinos offer only single or double odds. The typical Las Vegas “Strip” game offers 3 – 4 – 5 times odds. That means they allow you to wager three times your Pass Line bet in Free Odds on the Four and Ten, four times your Pass Line bet in Free Odds on the Five or Nine, and five times your Pass Line bet in Free Odds on the Six and Eight. Note that since the Five and Nine are paid at 3 – 2, the Free Odds bet on those numbers must be for an even amount of money in order to get a correct payoff. Let´s take a look at an example of a winning bet in a $10 minimum 3-4-5 times odds game. If the point is Six you can take 5 times odds. With a $10 Pass Line bet that translates to $50. If the six repeated before the seven rolled the dealer would pay you $10 for your Pass Line bet, and an additional $60 for your Free Odds bet. But suppose you have a limited bankroll and cannot afford to take the full 5 times odds. No problem. Starting as low as single odds and progressing in increments of $5, you can take $10, $15, $20, $25, $30, $35, $40, or $45 in Free Odds. As long as the amount you wager is greater than your Pass Line bet but less than the table maximum 5 times odds, the house will book the bet. Another betting option is the Don´t Pass Line. The Don´t Pass wager is just the opposite of the Pass Line. In this instance, you are betting against the dice. The player betting the Don´t Pass Line is betting the shooter will not be able to make the point established. The Don´t Pass Line bet is an instant winner on the come-out roll if the player shoots a 2 or 3. It is a push or a “tie” if the player throws a 12. If the 7 or 11 are thrown, the bet loses. The casino´s only advantage on the Don´t Pass is on the Come Out roll. Once a point is established, the Don´t Pass wager has an edge on every number on the layout. If any number other than seven, eleven, or craps is thrown it becomes the Point.Once the Point is established, the Don´t Pass bet wins if the shooterthrows a 7 before making his point. However, if the shooter repeats his point,the Don´t Pass bet loses. Unlike the Pass Line wager, the Don´t Pass is not a Contract Bet. The player can take the bet down any time he or she wishes. The casino allows you to do this because it is to their advantage to do so. Once a Don´t Pass bet is established, the player has the advantage over the house. If you do remove a Don´t Pass bet, you are not allowed to replace it during that game. Likewise, you cannot add any chips to your existing Don´t Pass wager. However, you may “Lay the Odds” against the point to increase the overall wager. A Come Bet is actually part of a game within the game. It follows the same rules as the Pass Line except you can only place it after the point is established. Place the bet in the Come area directly in front of you on the layout, then wait for the next roll. The outcome of the bet depends what number is tossed next. Like the Pass Line wager, the Come bet is an instant winner on 7 or 11 and a loser on a 2, 3 or 12. If the next number rolled is a “Box Number,” the 4-5-6-8-9 or 10, the Come Bet moves into the appropriate box on the layout. It then become the player´s Come point and remains there until the number repeats or the shooter rolls a seven. As with the Pass Line wager, players may “Take the Odds” to increase their bet. If the shooter makes his Pass line point, the Come bets stay up and carry over into the next game. The Come Bet “works” on the next Come Out roll, and loses if the shooter tosses a seven. However, the wager wins if the shooter tosses that number. The odds on Come Bets do not work when there is no point established, however, the player may request to have his “Odds Working” on the Come Out. A don´t Come Bet follows the same rules as the Don´t Pass Line except that it can only be bet after a point has been established. This bet is the opposite of the Come Bet, and odds are always working unless the player takes them down. As with the Don´t Pass wager, players may “Lay Odds” to increase their bet. Field Bets are one-roll bets. The player simply places his wager anywhere on the portion of the layout marked Field. The wagers will win when 2-3-4-9-10-11 or 12 roll and lose on 5-6-7 or 8. All Field Bets win even money except when a two or twelve roll. Those numbers pay double – and on some layouts, one or the other may pay triple the original bet. The Big 6 and 8 are self-service even-money bets that can be placed or taken down at any time. The bets only win when the six or eight roll. The bet loses when the seven rolls. the player calls them off during the Come Out Roll. Proposition Bets and Hop Bets are all one-roll bets located in the center of the layout. The Stickman places these bets on the appropriate betting area, and they win only if that specific combination of the number rolls on the next toss of the dice. These high paying bets are an exciting part of the game, with some of these bets paying as high as 31 for 1. Buy Bets are exactly the same as Place Bets except by paying a 5% commission on the Buy Bet, you receive the true odds. Buy Bets do not work on the Come Out roll unless called on by the player. A Buy button denotes this bet. You may Lay a bet against 4, 5, 6, 8, 9 or 10 at any time. When laying against a number, you are wagering that the seven will roll before that number. The casino charges a 5% commission based on what you could win. Lay Bets always work. Check the chart for the payoffs. A Lay button denotes this bet. The Horn Bet is a wager on a combination of four numbers: 2, 3, 11 and 12 (horn). If any of these numbers are rolled, you win, if any other number is rolled, you lose. One-fourth (1/4) of the Horn Bet is bet on each of the individual numbers, (2, 3, 11 and 12). The Horn is a one-roll bet. If any of the Horn numbers roll, you win. If any other number rolls, you lose. Crapless Craps, which is also known as Never Ever Craps, is a version of a standard dice game without the possibility of losing on the come-out roll. It is played almost exactly the same except there are ten numbers called point numbers. They are 2,3,4,5,6,8,9,10,11 and 12. The only non-point number is the seven. Pass Line bets win on the Come Out if a seven is tossed. Any other number becomes the Point. The shooter must repeat his Point before rolling the seven in order to win the Pass Line bet. 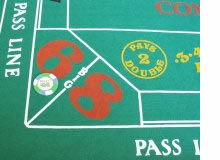 Note that the Crapless Craps layout does not have a Don´t Pass or Don´t Come line. A lively craps game is the ultimate when it comes to fun and excitement. As you can see, there are many ways to bet and just as many ways to win! But playing the game is as simple as placing a bet on the Pass Line or placing the six and eight. Then the fun begins. Copyright © by Axis Power Publishing, LLC. All Right Reserved.